People who are familiar with Puerto Vallarta never fail to mention the overwhelming quality of the light and color of the area. In the mornings you can watch extravagant sun rises over the Sierra Madres. During the day you can see the Marietas Islands, and the constantly changing blue of the bay. The sunsets are a fusion of colors, which are constantly changing. The night sky reveals the constellations to perfection because there are no city lights to diminish their clarity. The complex is very small. 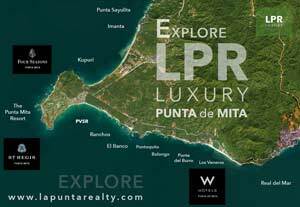 Punta Vista is comprised of two buildings each containing six units. Each unit occupies an entire floor. The penthouse comprises the top two floors of a building. The owners have tried to provide everything that you could possibly need to feel at home. If you don’tt like to eat every meal out, there is a gourmet indoor kitchen and a large outdoor grill. The owners have included All Clad cookware, beautiful dishes and every gadget that one might need to create elaborate meals. There is a Cuisanart, mixer, blender, coffee grinder, juicer, baking pans, cookie sheets, excellent cookbooks etc. The owners have also provided many staples so that guests do not have to buy salt, pepper, sugar, flour, paper products or soap products. They always have a supply of butter in the freezer for their guests because they think it will make people feel more at home. The electronics are all state of the art. There is a plasma television, Bose music systems that can be heard inside and outside, video, CD and DVD players. They have also made available movies, CDs, books and board games. This condo is ideal for the busy executive who cannot afford to be too disconnected from an office will find two phone lines, a computer with high speed DSL internet connection, printer, and fax. Everything from paper clips to pencil sharpeners is available for a business person’s needs. If you appreciate art, antiques, and hand or custom made furnishings, you will love the apartment. Most of the furniture was custom made for beauty and/or comfort. The art is all original, most of it done by the fine Mexican artists. Many of the lights were hand made in Italy. From the marble floors to the hand-cut granite counter top, every effort was made to make the inside of the apartment feel as special as its natural surroundings. The outdoor area is also very special. There are more than a dozen lounges and chairs for relaxation on both levels. You can dine outside under the chandelier in the palapa, relax in the hammocks or in the private Jacuzzi on the top deck. The outdoor shower made from two intertwining trees releases its warm water through a conch shell. It is beautiful, private and very romantic.